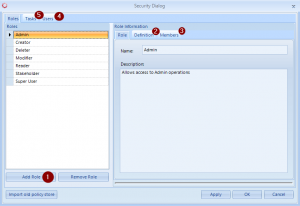 The fourth item in the main menu is the security features in RM Studio. Here you can define exactly the roles of different user groups of RM Studio. The basic element used to construct a Role is the Operations. RM Studio has different operations that together define everything that can be done in RM Studio. These operations can be further grouped into Tasks. Roles can then be defined to include certain Operations or Tasks. RM Studio comes with a predefined set of six Roles. 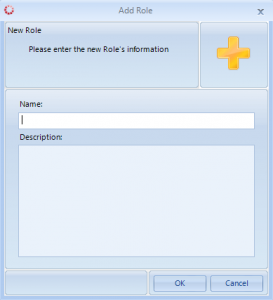 If you need to add a new Role click on the Add Role button (1) and a dialog box in will appear. This functionality allows you to fully customize a user’s access rights, roles and task within RM Studio. After you have entered the necessary information click OK.
After you have created a Role you then define it under the Definition (2) tab. By clicking the “Add” button you can add Operations, Tasks, or sub Roles to the new Role as appropriate. The third tab is the “Members” (3) tab. Here you can assign different users to the Role. Likewise, under the “Users” (4) tab you can assign Roles to individual users. Tasks define what a particular role can do in RM Studio. Adding a new Task is similar to adding a new Role; you need to navigate to the Tasks Panel (5) and click the “Add Task” button. One Task is made up from many Operations. Adding Operations to a Task is just like adding Tasks, Operations and sub Roles to a Role. You can even add other sub Tasks to a Task just like you could with Roles. The Users of RM Studio are locally defined RM Studio Users and users authenticated with Windows. To add a user go back to 2.2 in this support manual. Adding a contact is the same as adding a user.